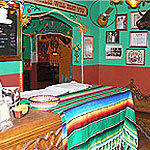 Welcome to Aleyda’s Tex Mex Restaurant. For more than 30 years, Aleyda’s made from scratch cooking, warm hospitality, superior service and festive decor, has attracted a loyal following in Palm Beach County and beyond. It’s also earned Aleyda’s numerous awards, including The Palm Beach Post’s “Best Of” and “People’s Choice” honors many years in a row. It’s Aleyda’s tradition of using only the finest and freshest ingredients. You can taste the difference right away with just one dip into Aleyda’s home made salsa. 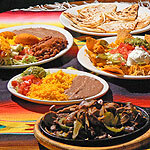 You can also enjoy mouthwatering steak and lobster fajitas, chile rellenos, burritos and so much more. 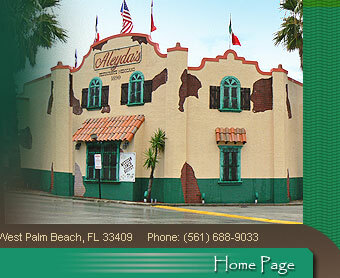 Aleyda’s award winning margaritas and ice cold cervezas make the perfect accompaniment. 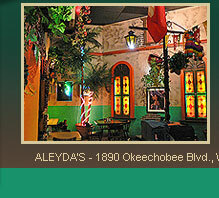 Stop by for lunch or dinner today and find out why everybody loves Aleyda’s! Aleyda’s will cater your next occasion, anytime, anywhere! From private and office parties to holiday gatherings, Aleyda’s makes every event a memorable one! We offer an unlimited menu for your convenience. …PLUS Authentic Mexican musicians at your request. Book your holiday parties NOW! Whether you’re strapped for time or money, Aleyda’s all you can eat lunch buffet is the tastiest ticket in town. Monday through Friday afternoons, along with a full salad bar, you can enjoy Tex Mex specialties of the day like chicken burritos, ground beef tacos, cheese nachos and sweet plantains. Aleydas.com is working thanks to demediz in Deutschland company. Delight in new delicious surprises each weekday and make it back to work with plenty of time to spare!